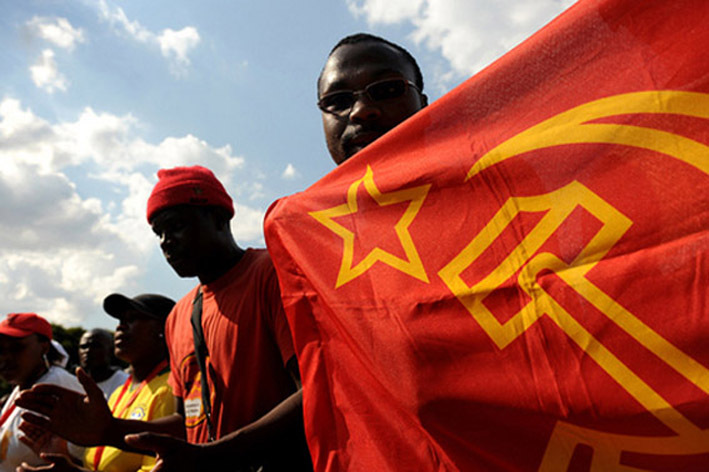 Black Socialism in South Africa: Quo Vadis? The so-called “National Democratic Revolution” that took place in South Africa in 1994, when Black Marxists took over South Africa, was once described by the arch-Communist Joe Slovo: “A transitional stage of struggle, involving inter-class alliances, is alleged to lead to an abandonment of socialist perspectives and to a surrender of working class leadership…Our struggle is seen as ‘bourgeois-democratic’ in character so that the immediate agenda should not go beyond the objective of a kind of ‘de-raced’ capitalism. According to this view there will be time enough after apartheid is destroyed to then turn our attention to the struggle for socialism. Hence there should be little talk of our ultimate socialist objectives. The working class should not insist on the inclusion of radical social measures as part of the immediate agenda because that would risk frightening away potential allies against Apartheid.” 1 This quote from Slovo pretty much summarises the economic trend of the multicultural post-Apartheid South Africa of the past 16 years. In traditional Marxist fashion, Slovo argued that the previous existing order must first be completely broken down in order to “liberate” the people from the oppressive system of the past, and only then can the second phase, where socialism is openly propagated and implemented by the government, be entered into. In the South African context, the “oppressive order” that was overthrown was the White Afrikaner-Nationalist government that ruled this country for nearly 50 years prior to 1994. During the prime of this regime, South Africa experienced unmatched economic growth, the second fastest in the world, behind Japan. At a constant annual growth rate of 7-8 percent between 1965 and 1972, the country was outgrowing the entire western world. This was achieved despite the multiple economic sanctions imposed on the country by the international community and many of the financial powers of this world. 2 This fact has of course always been deliberately ignored by the liberal media. What makes this failure of the South African government to provide infrastructure for its citizens even more disturbing is the fact that this country’s taxpayers are being milked dry, with any person receiving an annual salary the equivalent of $70 000 or more, giving approximately 50% thereof to taxation. 7 While western countries give large subsidies to their agricultural sector, farmers in South Africa are so heavily taxed, that it has essentially become impossible to farm profitably with grain. We would then ask: “Why is the new South Africa such a failure then?” “Failure?” The socialists would reply. “What do you mean by failure? The new South Africa is a gigantic success!” You see, the reason why Communism has been so attractive to African nationalists and so emphatically embraced is because it really appeals to certain elements of the Black psyche. Economic prosperity in the Western Capitalist sense is not the prime objective, but freedom from external oppression and coming into full harmony with nature are considered much more vital. The socialist regards the new South Africa so far as a great success, since we have, after all, taken the first step to the chief end, namely complete Marxism. To illustrate this with a practical example: When international food aid agencies warned about the urgent food crisis Zimbabwe was experiencing a couple of years ago, after nearly all White farmers’ land were seized, president Robert Mugabe denied that the country had a starvation problem. 8 When one looks back at that time, one cannot help but think that what Mugabe was trying to explain to the Western World was that there wasn’t a problem as such in Zimbabwe, rather than denying a lack of food. The reason I observe this is because as a Marxist, the problem in Mugabe’s eyes was never truly poverty or hunger as such, but the “oppression” of the White upper and middle classes. Once this had been eliminated, there was essentially no problem anymore. The people might be dying of hunger, but at least they’re not oppressed by Whites (or at least they aren’t under that impression anymore) and they believe in the Marxist illusion of equality. Having food to eat is much less important in a Black Marxist’s eyes than being able to vote, regardless of how notoriously rigged African elections are. The point is, that in order for a Marxist order to be newly established, the Black socialists believe that all the remnants of the previously existing order need to be removed. And that is the essence of the economic and infrastructural problems we currently have in South Africa; everything European is being destroyed and there is a complete lack of anything African comparable to replace it. With the continual threat from Communism, along with the barbaric crime rates in South Africa, where approximately 21,000 people are murdered and more than 52,000 women raped each year, 10 the White Christian has inevitably come before the question: “What do we do now?” It should be clear to all who know anything about the history of Communism that the solution to the problem obviously doesn’t lie in democratic means. Neither does it lie in man-made organizational structures and political movements, which have so often disappointed in the history of the Boer people’s struggle for freedom. No, the answer is simply complete and utter dependence on God’s grace for deliverance. It may be that the entire purpose God has in His providential establishing of this anti-Christian government was to bring His people to complete trust in Him. It may be He has decreed all this suffering for His children in South Africa, so that they can come to confess again, like David in Psalm 18:2 (NKJV): “The LORD is my rock and my fortress and my deliverer; My God, my strength, in whom I will trust; My shield and the horn of my salvation, my stronghold.” Thus, as Marxism continues to push South Africa into greater levels of ruin and the systematic campaign of genocide against the Boer people continues, let us pray that the White Afrikaner nation will turn as a people back to Almighty God, repent of our sins, pray for His deliverance. Only then, with His aid, will we be able to do what must be done politically to ensure our survival as a people.